Financial services as an industry is a sector that is rapidly being disrupted from all directions. One of the startups helping to lead the pack is Wealthfront, an automated investment firm that serves as an alternative to traditional financial advisory services like Fidelity. Today, the company is announcing $35 million in new funding led by Index Ventures and Ribbit Capital with existing investors The Social+Capital Partnership, Greylock Partners and DAG Ventures participating, we’ve learned exclusively. Also joining this round are Marissa Mayer, Kevin Rose, Paul Kedrosky, Mark and Ali Pincus, Alison Rosenthal and Tim Ferris. This brings the company’s total funding to $65 million. The brainchild of former Benchmark Capital founder Andy Rachleff, Wealthfront launched in 2011 to give anyone access to the type of financial planning that would normally only be available in private wealth management shops of Goldman and others. Rachleff brought on former LinkedIn product VP Adam Nash as COO in 2012, and handed over the CEO reins to Nash earlier this year. After two and a half years of operation, Wealthfront is now managing $800 million in assets, making it the largest and fastest-growing software-based financial adviser. To put that number into perspective, Wealthfront began in 2013 with just $100 million assets under management, growing over 450 percent in just one year. It took Wealthfront almost a year to reach $67 million in assets under management, and in the first quarter alone, the company added over $250 million in assets managed. For background, Wealthfront goes beyond just automating investing — the company’s fees are set up to undermine the models of incumbent investment services like Fidelity, Charles Schwab, and any other mutual fund investor or financial adviser. It also comes with features like tax-loss harvesting for any account worth at least $100,000. If you make a profit on parts of that account’s portfolio, it’ll reinvest it and avoid taxes on the gains by doing so. The company says its clients vary in age between 19 and 93, with over 55 percent of users under age 35. 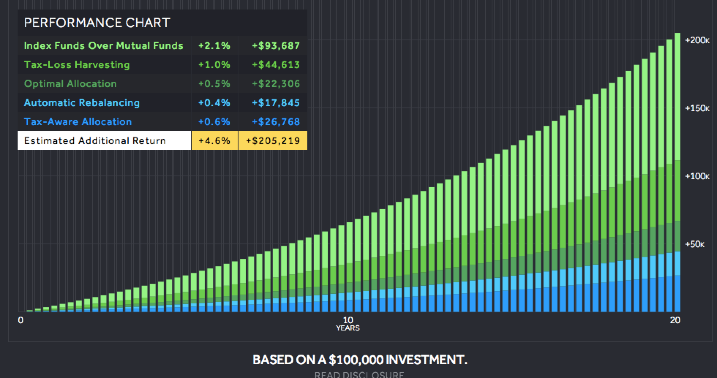 The average Wealthfront client invests $80,000 to $100,000, but the minimum continues to be $5,000. Wealthfront now provides service to clients across all 50 states and Washington, D.C., with client accounts ranging in size from $5,000 to over $10 million. Additionally, Wealthfront is free for accounts under $10,000, and 20 percent of Wealthfront clients have a liquid net worth of less than $50,000. Over 16 percent of clients’ liquid net worth is in excess of $1 million. Unsurprisingly, the client base tends to be tech-heavy. The companies where Wealthfront has the most clients are, in order, Google, Facebook, LinkedIn, Microsoft, Twitter, Palantir, VMware, Apple, Intuit and Cisco. But what’s interesting is that there are also many lawyers, financial professionals, teachers, doctors and even military that Wealthfront counts as clients. Where is this growth coming from? Nash says that the company has done some advertising online but for the most part, growth has been word of mouth. (And it should be noted that the company brought on former Facebook, Twitter and Quora growth expert Andy Johns, as well). This steady growth is perhaps why investors, existing and new, are betting on the service to disrupt financial planning the way Charles Schwab did decades ago. In fact, Nash draws a lot of comparisons to what Schwab did and what Wealthfront is doing. As he explains, Wealthfront is doing today for Millennials what Charles Schwab did for the Baby Boomers. Schwab launched in the 1970s and its early customer base consisted of people in their 30s with smaller accounts. Schwab now manages $2.2 trillion and its average client is in their 50s with over $200,000 invested with the service. Just as Schwab grew up with the Baby Boomer generation, Wealthfront wants to ‘grow up’ or scale with the Millennials and Gen Y, which represent more than 90 million people in the U.S.
Nash says that Millennials currently have a liquid net worth of $1 trillion and their estimated net worth is predicted to grow to $7 trillion by 2025, demonstrating a fairly large market to go after. Wealthfront serves this generation better than others because many of these professionals like the idea of an automated service that they don’t have to worry about. Features like tax-loss harvesting and general tax efficiency based on asset level save people time. “Our goal is to help make investing simple for people to do the right thing, and help make this automatic so they do the right thing for the long-term,” Nash says. One of the things that Wealthfront has been able to do with relative ease is create trust among users, Volpi adds. “It takes a long time to establish trust, but once you create this, people don’t leave. Especially with finances, people want to sleep well at night and know their money is being managed well. That’s what Wealthfront represents, but with a modern twist,” he says. Volpi actually knows this industry very well — his father worked in private wealth management for UBS. When Volpi told him about the idea with Wealthfront, his father’s response was that he was fortunate he retired early because he could easily see how Wealthfront could disrupt his business. Another area where Wealthfront has been devoting time is in resources. The company has a blog that creates helpful content around subjects like your 401(k), post-IPO share strategies and more. In fact, Wealthfront has been working to personalize the experience more, especially on mobile, where the startup will serve your tailored content specific to your needs. Personalization is at the forefront of the future product vision, and Nash says there will be more to come. Wealthfront is fairly lean with only 35 employees, so the company will be adding engineering and design talent in the coming year. Most importantly, Nash and his team are focusing on adding new users and delighting customers, which has been his goal from the start of 2014. And the product will continue to evolve based on customer needs and concerns, he adds. It’s important to note that there are a number of competitors in the space who are looking to become the next-generation financial advisory platform of choice, including Betterment, Personal Capital, and SigFig. And taking on dinosaurs like private banks and even companies like Fidelity is ambitious to the say the least. But with trillions of dollars in assets at stake, there is room for many players in the online wealth management space. And as technology companies (with an eye for design) continue to disrupt traditional verticals like transportation, hospitality and health, financial services is going to have its own Ubers and Airbnbs of the world. Wealthfront could be that company.